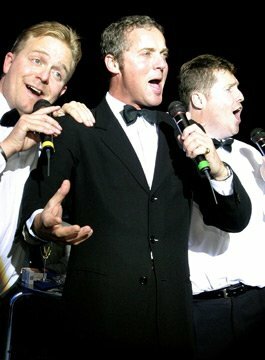 The unique concept of The Three Waiters involves three talented performers hoaxing and infiltrating your event as real waiting staff. The Three Waiters is not a ‘wacky waiters’ show, but in fact, quite the opposite. The show provides sophisticated, high quality entertainment made up of some of the best performers that opera and music theatre have to offer. The structure and content of The Three Waiters suits a wide spectrum of audience taste by taking away the seriousness often associated with opera and adding an element of fun, spontaneity and surprise. With a repertoire consisting of arias made famous by ‘The Three Tenors’ along with well-known songs from popular musicals, The Three Waiters have proven equally successful with an audience of auto mechanics through to the most discerning opera buffs. Subtly, the performers infiltrate the function. They work as waiters and are dressed in the same attire as the regular waiting staff. The audience is given no clue of what is about to come. Picture your next event – the evening is running according to plan with the usual mixing and mingling of invited guests and clients. Suddenly, one of the food or beverage waiters bursts into an aria from a well-known opera or song from a popular Broadway musical. Your guests are simultaneously stunned by the waiter’s behaviour and intrigued by the fact that the waiter sang so well! As the evening progresses, another waiter performs a similar spontaneous rendition of his own – with matching professional aplomb! At this stage, the collective audience realises that all is not as it seems and they begin to anticipate some progression of the unexpected yet highly enjoyable theatrics. Be it a dinner party of twelve guests or a ballroom of two thousand, the unique structure of the show, along with the vast repertoire and experience of each of the performers allows the act to be easily customised to suit your particular requirements. In 2003, The Three Tenors (Jose Carreras, Placido Domingo and Luciano Pavarotti) sang in Bath’s famous Royal Crescent to a sell-out audience and watched by another 20,000 people on giant screens in a nearby park. The Three Waiters were invited to infiltrate the after-show VIP dinner, and in doing so, received a standing ovation by The Three Tenors – a remarkable testimonial. "You made an ‘ordinary dinner’ into an ‘extraordinary event’ by providing more than a little extra which made the evening memorable." "Well done guys - just superb!" "I have no end of comments regarding the event and they al include the attendance of The Three Waiters. At one point during the performance I saw two ladies and two different tables reduced to tears – now that’s powerful!" "The Combination of ‘suspect waiters’ breaking out into operatic verse is truly great and I will recommend you to anyone running a similar event." "The event was a huge success and most people left the event with the same questions “What do we do next year to better it?” I just don’t know."